Ebay is always fun. It doesn't matter its listed as a race car. Doesn't matter it has DOT and EPA approval, they still manage to take down listings. Heres Igors car, for sale . 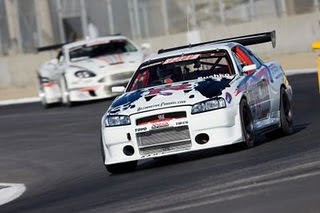 The Automotiveforums.com R34 GT-R is for Sale. This is the first and only Nissan Skyline GT-R to have been raced in the United States in a professional road-race series. Back in 2006, the AutomotiveForums.com Race Team competed in Speed World Challenge GT across the country against Dodge Viper Competition Coupes, Tube-frame Chevrolet Corvettes, modified Porsche 911 GT3 Cup cars, and even Aston Martin DBRS9s. With the field sporting around 560whp, we struggled to compete with a package that intially only delivered about 450whp. By the end of the season though, our car was on par in horsepower with over 580hp to the wheels. Links to some photo albums of the car. The car was originally raced in the Japanese Super Taikyu series, built by NISMO. Only about 12 were built, and who knows how many remain. However, the spec in the Super Taikyu series was rather low for World Challenge GT, so in 2005 we proceeded to upgrade the GT-R. All bodywork was changed to carbon/fiberglass to lose weight, the transmission changed to a Holinger 6-speed sequential, a triple plate carbon clutch was custom-made by Tilton to ensure successful standing-start launches. All windows were changed to Lexan. In all, we were able to trim the weight of the GT-R down to under 3050 lbs dry - over 200 lbs shaved off the Super Taikyu-spec. Note that this is a weight that an R35 GT-R could never be in an AWD trim. To run the 305-width rubber on the car, Rays Engineering/Mackin Industries were kind enough to custom make light-weight 18x11J width Volk TE37s in Japan specifically for this project. In 2005 testing, we quickly learned that the stresses applied to the car on 305/35/18 Toyo Proxes RA1 tires were severely more than the Super Taikyu-spec 250-width slicks, prompting us to find solutions to hub/bearing failures. Mr. Tetsuo Suzuki, the crew chief of the Nurburgring 24-hr Falken GT-R team was introduced to us by NISMO to help us find solutions. The Nur GT-R also had similar problems as it used 290-width slicks, so we followed their suit and upgraded the hubs to those used on the Nissan Cima luxury vehicle. To comply with World Challenge GT safety regulations, we installed a custom NASCAR-style cage in addition to the FIA-certified cage that was in place from the car's time in Japan. This is a true one-of-a-kind Nissan Skyline GT-R racecar. An extensive spare package including a whole spare chassis is available. EPA and DOT exemptions for off-road use for both chassis.